Over 600 delicious seafood items, if you don't see it – just ask! 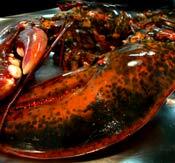 Ahh…..close your eyes and imagine the succulent taste of fresh cold water New England lobster. We ship them live or steamed for a truly memorable dining experience. Bibs, placemats & cooking instructions included. 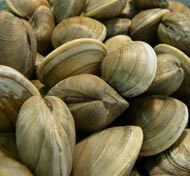 Fresh Littleneck Clams for steaming or serving raw on the half shell. Also available: Fresh Steamers, Razor Clams, Oysters, Cockles, Chopped Clams and don't forget Bud's zesty cocktail Sauce! 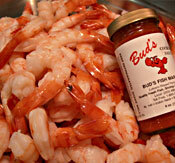 Freshly shucked, sweet, tender “meats” of the sea direct from Bud's harvesters off the New England coast. 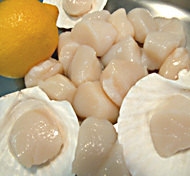 These wonderful scallops are “dry” with no preservatives! Beautiful firm white meat, cut to your liking that will melt in your mouth! Freshly caught off of Block Island, RI. The best swordfish you'll ever taste! 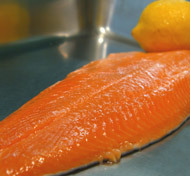 Only superior Grade A Salmon is selected for Bud's hand cut fillets, steaks, chunks or whole fish. 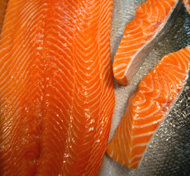 Irish, Scottish, Norwegian & Alaskan Salmon are available at different times of the year. Colors may vary. 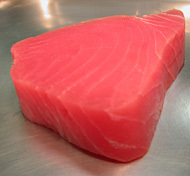 This is Sushi Grade Ahi Tuna, no trimming needed. Gorgeous steaks, chunks or loins are cut to order! Authentic Icelandic Haddock! 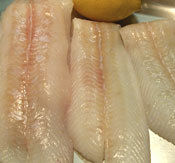 Pure white, shiny, hand scaled fillets. We leave the skin on to prove that you are truly getting fresh haddock! Bright “Red” mouth watering, sweet meaty legs. 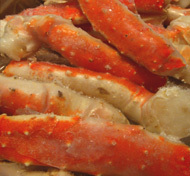 Long legs or special cut sections are available. You'll never see (or taste) better legs than these! If you like salmon, then you'll love Icelandic Arctic Char! Lighter than salmon with a unique fine flavor. 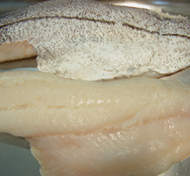 Hand cut fillets or whole fish are available. 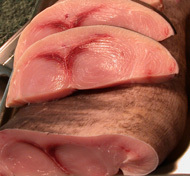 Pure white, long boneless thin fresh fillets cut daily. Excellent stuffed and rolled. Try our great seafood stuffing – what a delightful entrée! Fresh delectable cocktail shrimp all ready to devour! Available in large & medium sizes. (Don't forget Bud's Cocktail sauce!) 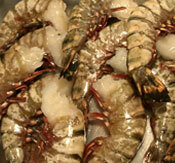 Raw Shrimp: either Shell-on or Peeled and Deveined, in all sizes. 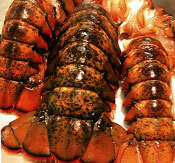 From the cold waters of Maine, we offer you the sweetest, tender, mouth watering lobster tails in varied sizes. Excellent grilled, baked or stuffed! Fresh delectable extra large grilling or baking shrimp. Great for Stuffing! 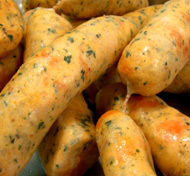 Firm texture, very tender. A tasty blend of fresh salmon, cod, shrimp & scallops with spices & no breading! Great grilled or sautéed. Our fabulous seafood spread is a blend of hickory smoked shrimp with crabmeat and mayonnaise. 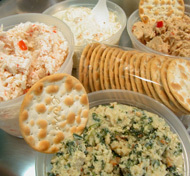 Also available: Lobster, Tuna, Wild Salmon and Chilpolte Crab spreads. All are real party pleasers! Fresh Lobsters & Seafood Shipped Nationwide!